Current and past adventures with a sense of humour. 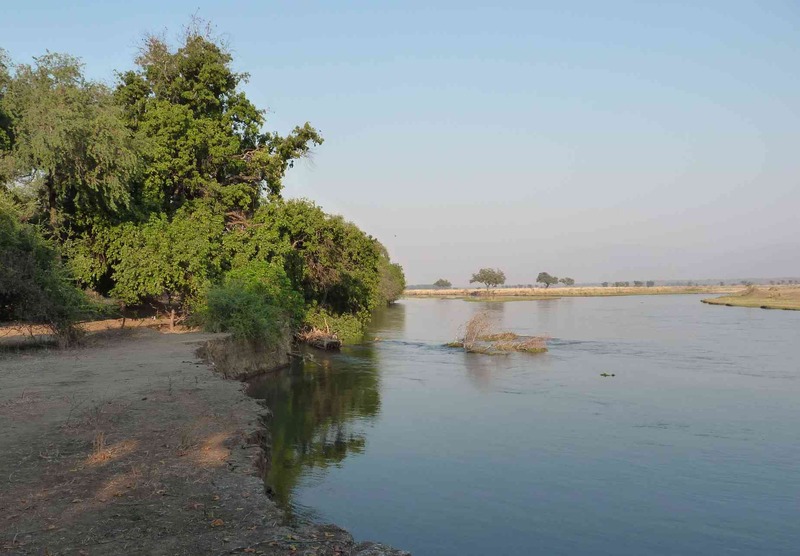 We returned to the Chitake springs in the Zambezi valley exactly three years since our first visit . This time we went alone, my wife and I and, luckily again, we managed to secure the very sought after Campsite 1 (we booked it one year ahead of time!). Aware of the “fun nights” that you spend in this amazing place, we prepared ourselves for any eventuality taking our “heavy duty” tent and planned to park our car near one of its entrances as our emergency exit, following the advice of our son, a bit worried about the “oldies” being alone in the wilderness! The Chitake river with its springs is one of the wildest areas left in Southern Africa. There are only two campsites open to the public (although we learnt that a third campsite can be booked at Nyamepi in Mana Pools). There is also a campsite for tour operators near Chitake 1. This arrangement ensures that you are unlikely to see many people around! In addition, most of the exploring is done on foot so no much driving needed either. Water accumulates at certain areas. Another view of the springs. Animals dig for water in certain areas. One of the game access areas to the springs. A flock of Helmeted guinea fowls runs across the dry river bed. The fact that water seeps from the ground on a daily basis supports a population of game animals that dwell nearby. There are numerous buffalo, zebra, greater kudu and impala that in turn feed predators such as painted dogs, hyenas, leopards and lions. 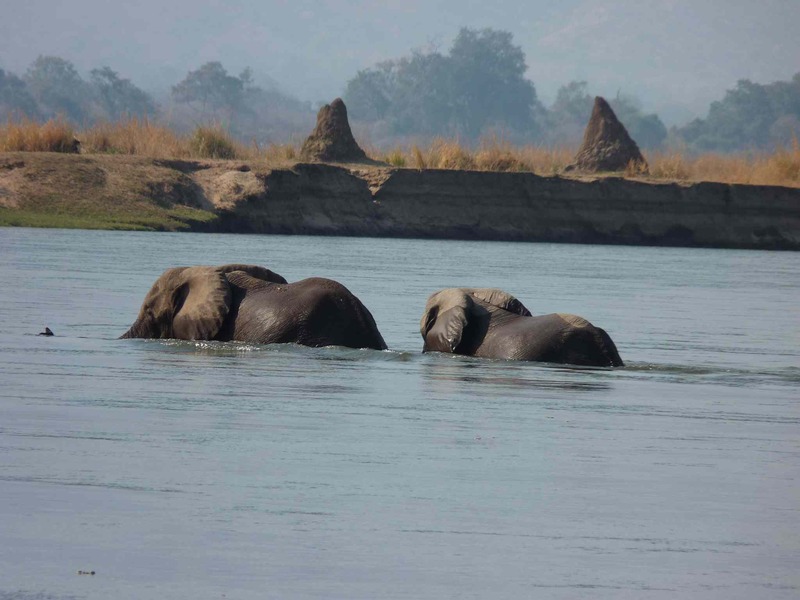 In addition there is a substantial elephant presence that files daily along the dry riverbed towards the water source. Campsite 1 is about two metres from the usually dry river bed and to be there waiting for “events” is an unforgettable experience that not all are prepared to take. 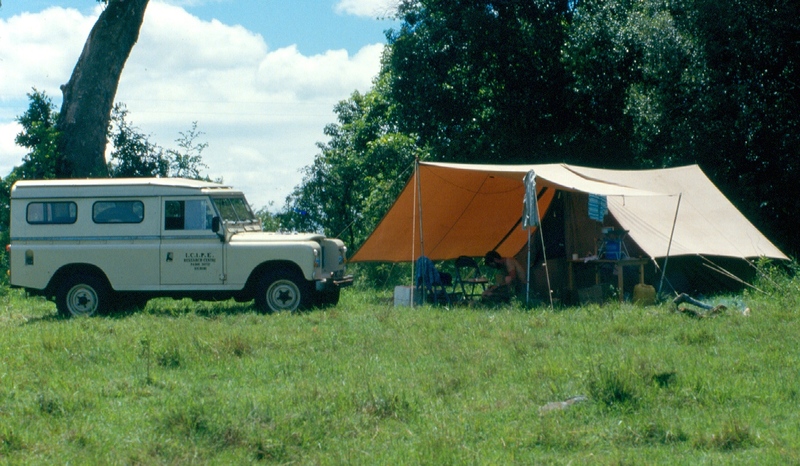 We have camped all our lives and taken precautions in Kenya and other “open” camping places. The access to the river from Chitake 1. We did not feel endangered and we knew that the only possible cause of problems would be the lions that were present in the area and we know that they respect tents. Our main concern was about the time you spend at camp in the dark as the camp is surrounded by thick bush. In particular nocturnal physiological needs were a worry as we needed to reach our long drop a few metres away! We arrived in the afternoon and spent some time to locate our camp in a spot as safe as we thought possible within the camping area. As we had food already prepared, we were in for an early night. We set up our camera trap to “see” what was lurking in the dark around us and went to sleep. The night passed off rather calmly at camp although we heard the elephants walking nearby on the way to the water and the hyenas calling early during the night. We were probably tired and sleep came easily. The camp. The car was kept near the tent exit. We were up early the following morning and all appeared well. We checked the camera trap and confirmed that there was life around our camp. Some of the night visitors. After that we decided to have breakfast prior to a short game drive as there are not many roads around the area. Then we noted that our 5-litre water container had disappeared! It was one of these supermarket transparent bottles that we had as a back-up in addition to the 40lts we had brought as Chitake does not offer any. Although we searched the surrounding area, we failed to find the bottle! We could only speculate on the possible culprits. We discarded human interference, as thieves would steal more valuable stuff from the camp. We rejected the baboons as they do not move at night. That left us with the hyenas as the possible culprits. We heard them and saw their footprints at camp. In addition, we had had encounters with them earlier in Kenya and they can get very cheeky! We decided that the latter were likely to be the culprits but the enigma remains. Our short morning drive took us to a bunch of vultures feeding on the remains of an impala that had clearly been killed earlier that morning. About twenty White-backed were scuffling for the few remaining meaty bits while a couple of Lappet-faced waited for their time to tackle sinews, tendons and the like. The rest of the day remained peaceful, contemplating the various animals coming down to drink at the springs from our camp chairs located at the riverbed that -luckily had good shade. While there we were assaulted by tabanids and tsetse flies so we needed to use large amounts of repellent and still we got hammered! My wife contemplating the springs from the shady riverbed. Tsetse and other biting flies collected from the floor of the car. Hundreds of impala came to drink in the morning and they were joined by small groups of greater kudu and zebra. When we saw a large dust cloud rising behind the gorge where the springs are, we knew that the buffalo had arrived and they were soon at the springs satiating their thirst. Quite a sight! After the dust settle we could see the buffalo drinking. As usual the day went fast and it was soon time to prepare for the evening. We were encouraged by the relative quietness of the earlier night and hoped to sleep well. 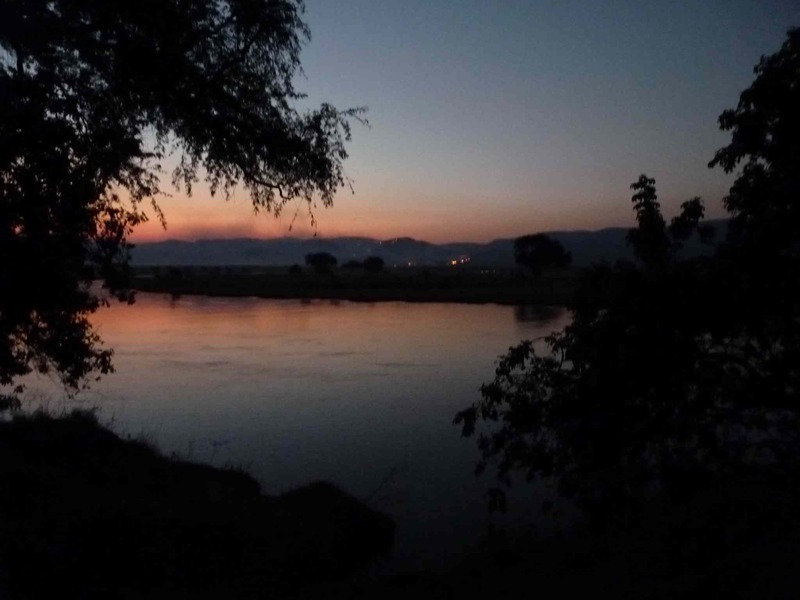 There were some early indications of trouble when, as soon as it was dark, several hyenas started to call from different places along the river. When we heard them laughing we knew that they had become excited for some reason, probably a kill although we were in no condition to discover the cause! From the tent we started hearing elephant movement. We spotted several family groups walking rather nervously and trumpeting frequently showing that they were also nervous. As it was getting late we retired to our tent. I went to sleep soon afterwards as I have a reputation to live up to! The next thing I remember was that something grabbed my ankle and it was shaking and pulling me! For the few hundredths of a second (or less, I do not know) that it takes to move from being sleep to some kind of alertness I thought I was a goner and that the dreaded time of being taken by a wild beast had finally come. My wife’s voice brought me back to reality: “There is a leopard there!” I muttered “Where?” thinking that it was inside the tent and taking me! I then realized that she was responsible for holding my foot on her third attempt at waking me up! The picture soon became clear. With one hand she was keeping the torch light on the leopard through the tent window while, with her free hand, she had been shaking me for a while to alert me about the leopard sighting! I must admit that it took me a while to recover from the severe fright and once I made sure that all my organs were functioning as expected -including my eyes- I looked where I supposed to and stared at the disappearing leopard’s eyes on the riverbed, a few metres away. My rude awakening took place after 3 am and we were still awake listening to the sounds of the wild after an hour. 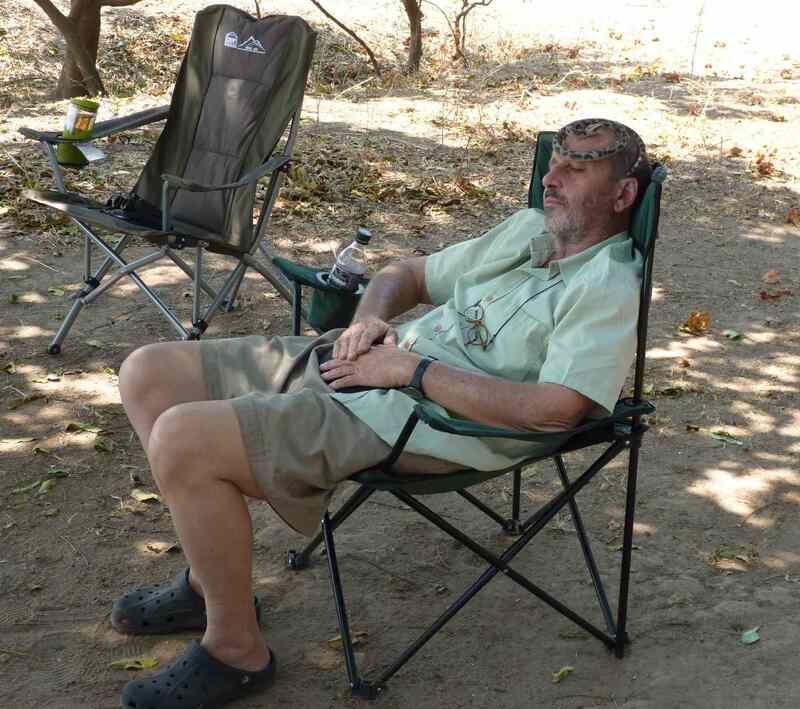 I then learnt that my wife had not slept much as the leopard(s) had been calling every once in a while and she had been trying to locate them on the riverbed (from the tent of course!). In addition there were some noisy little mice digging under the tent that she tried to fend off by hitting them through the canvas as well as hearing the monotonous calls of the Fiery-necked Nightjar (Caprimulgus pectoralis) in the distance. This bird is capable of up to 110 repetitions of its call believed to say “Good Lord, deliver us” before stopping!. The following morning, as expected, we were not up early. After a leisurely branch we did spend time examining the abundant spoor at the riverbed but we did not detect any signs of a kill. We confirmed that the leopard(s), as my wife mentioned, had walked up and downstream. We also found plenty of hyena and painted dog spoor as well as lots of new signs of elephant over their “highway” to and from the springs. Checking for activity and spoor at the dry river bed after the long night! Elephant footprints next to the Bushsnob’s Croc. The camera trap pictures showed hyenas as well as several elephants walking during the night. Later on, while exploring the area by car, we found a group of five hyenas resting under a shade. The same as us they were suffering from sleep deprivation as they were clearly some of the culprits of the noisy night resting! We spent the rest of the day exploring the river bed on foot and luckily, it appeared that all animals -including us- were drained from the previous night as the last night we spent at Chitake was peaceful and my wife recovered her lost sleep while I did my usual trick of instantly dozing off. Roberts VII Multimedia Birds of Southern Africa. iPhone and iPad Edition. Version 2.4. Southern African Birding. The morning after the Maasai chicken dinner a good breakfast was in order! We prepared bacon and eggs to compensate for our austere meal of the night before. In an attempt at avoiding another fasting episode I offered to take over the next dinner and to roast the beef we had brought from Nairobi. After breakfast, another day of routine field trials followed, as we needed to do many replicates of our tests in order to confirm the results. We worked without stopping until late afternoon when we decided that we had done enough and it was time for a shower and to prepare dinner. As a South American I am ashamed to confess that I am fearful of horses and prefer to keep a good distance from them. That is not all, I am a real disaster at barbequing! Therefore, on the occasion I struggled through and I made sure that the food was abundant and we ate our fill. The night was truly spectacular. The relative short distance of Intona ranch from Lake Victoria meant that it rained very often. It poured in late afternoon and then the sky cleared at dusk. The consequence was that the rains cleaned the air and the night sky was always very sharp. Ernest and I stayed awake until late talking and contemplating the pristine sky. We talked about many issues, occasionally stopping to listen to the night sounds, in particular the spotted hyena calls getting closer to our camp. Getting gradually bolder they moved close to the periphery of the light of our camp fire. I reassured Ernest that this was a normal event when camping at Intona and that “normally” hyenas would not be aggressive. Despite the good time we were having, we have had a long day and we felt very tired so soon we went to bed. As soon as we were inside the tent we heard something sniffing all around our tent. A white-tailed mongoose was seen scurrying away when we shined our torches. That small mystery solved, it was back to bed, hoping that sleep would come soon. Not so. This time it was a loud crush outside the tent that also merited investigation. This time a hyena was the culprit! The beast had grabbed a dirty pan and had taken off at speed. We run after the beast but it was a futile effort and came back to bed thinking on resuming the search for the pot in the morning. 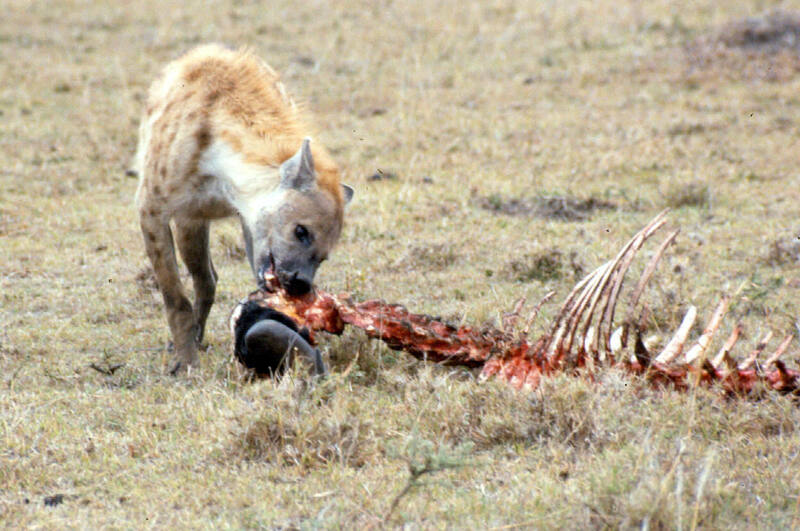 A Brown hyena with wildebeest carcass in the Maasai Mara. Its cousins visited us nightly at Intona. While thinking and hoping that normality would return, I finally fell sleep. Again, it did not last long. It may have been 03:00 hs when I heard Ernest opening the tent door zip. My first thought was that his gut had finally lost the fight against the filtered water drunk on the way in! In addition, aware of the hyenas I remained awake although without moving, hoping to go back to sleep immediately. No chance! Ernest came back and started to shake me up shouting “Wake up, the sky is perfect to look for planets!” I felt like slaying him but, remembering his partial deafness and on account of his contagious enthusiasm, I made the mistake of getting up! By the time I managed to go out of the tent, Ernest was already looking through the binoculars, identifying the various noteworthy celestial bodies, accompanying his successive discoveries with shouts of joy! Although I had enjoyed contemplating the night sky both in Uruguay and in Kenya, I have never been that interested in astronomy. However, he convinced me to look at Jupiter (a small orange sphere) and even managed to see Saturn and what I though were its rings! Finally Ernest’s excitement subsided and we managed to hit the camp beds again, this time until the sun was up! The large ball of crunched aluminium that we found about one hundred metres from our tent was not the remains of a recent asteroid that had narrowly missed us but all that remained from our cooking pan after the hyenas had squished it to get its juice. Although our cooking options suffered another severe setback we still managed to produce some pan-less and chicken-less dinners during the following days! To write these lines I needed to sit down and in so doing, I sat on a snake! Luckily any concerns you may have about my derrière are unnecessary as said snake was made of rubber. Yes, I know, I should not be playing with toys at my age but some of us are take longer to mature! Baboons and vervet monkeys are a menace while camping in Africa, and Mana Pool’s lodges are no exception to the rule. We learnt that rubber snakes are a good deterrent so we alwayscatter a few around our area while on safari. They work well and we have had fun watching monkeys perform panicky gravity-defying summersaults while screaming in terror after spotting them! I will come back to the topic of monkeys and camping in the future, so for now I turn back to Mana Pools. 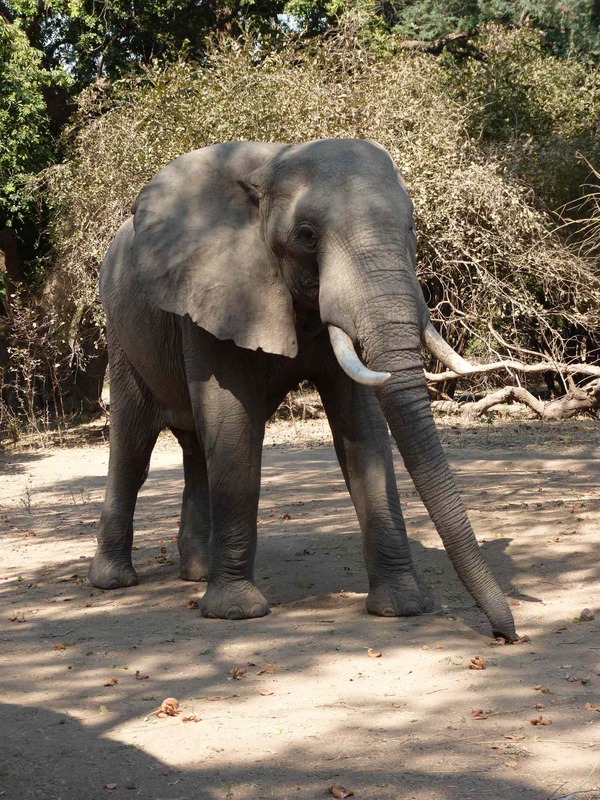 In my earlier post I mentioned that in Mana Pools you are able to go about freely on foot. Funnily enough, you often come into much closer contact with wild animals while in your lodge or campsite than when walking in the bush. The former (named by the Zimbabwe Parks & Wildlife Management Authority) is a small house with one or two bedrooms, a kitchen and a toilet. Solar lamps provide lighting and there is a freezer, a gas cooker and a BBQ place. The ubiquitous Tanganyika boiler -firewood operated- provides ample hot water while the vervet monkeys and baboons come free of charge! 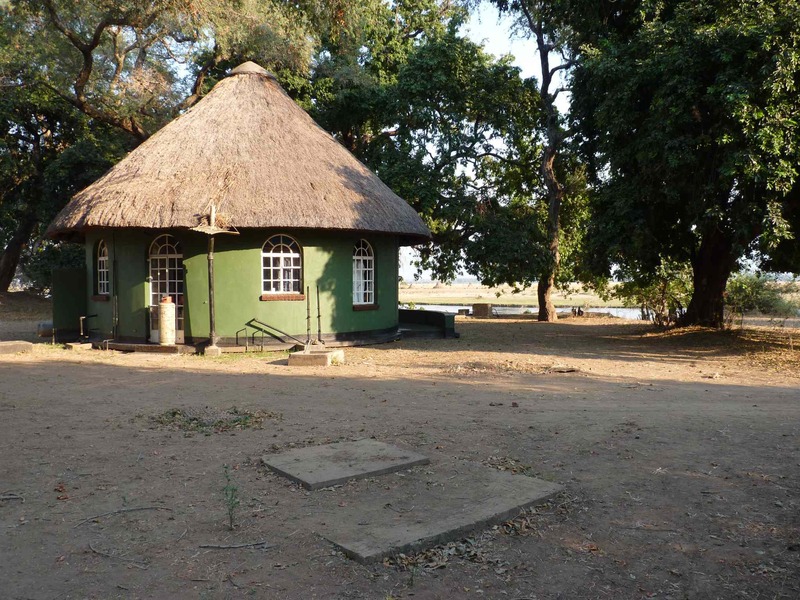 The lodges are well positioned, only a few metres from the river bank providing great views of the Zambezi. The sunsets over the river were spectacular as usual. The Zambezi river seen from the lodge grounds. 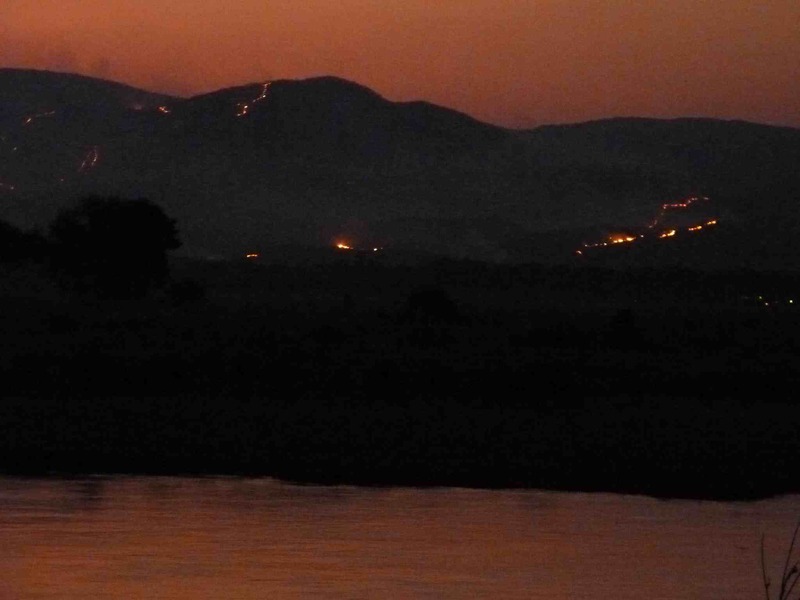 At the time of our visit the sundowns were made even more dramatic by the bush fires raging on the mountains opposite us, across the river in Zambia. Most nights the hills were decorated with crisscrossed fire garlands that devoured the dry brush voraciously and added drama to the view. A view of the burning hills (apologies for the bad picture). Usually we are at the lodge in the morning (before leaving for a walk or game drive), lunchtime (when you are not in the bush) and in the evening (always). It is during these times that you have the closest encounters with wild animals. In the early mornings we were woken up by loud birdcalls that made going back to sleep rather difficult. 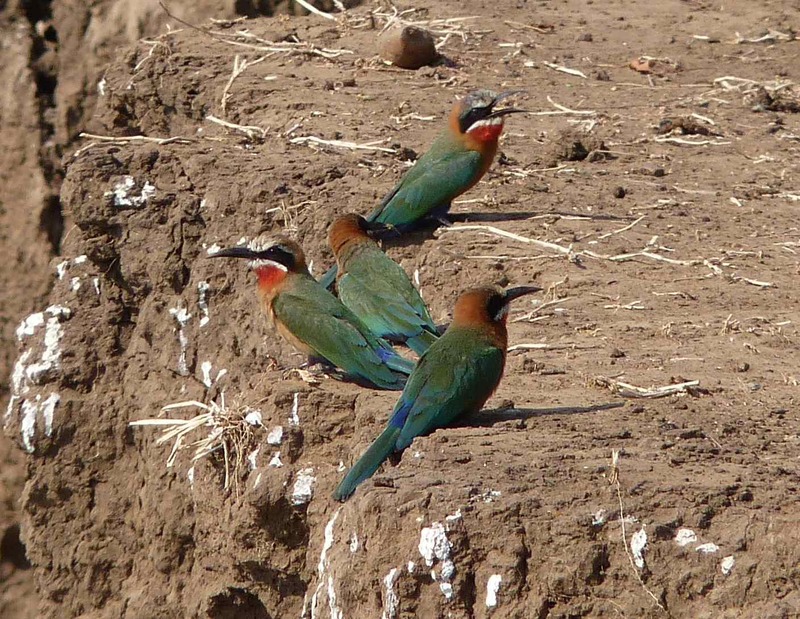 The din came from the goings on of a colony of white fronted bee-eaters (Merops bullockoides) that had their burrows in the banks in front of our lodge. With them were also a large number of the much bigger southern carmine bee eaters (Merops nubicoides), adding more colour to the scene while basking under the morning sun in the treetops above our lodge (a magnificent sight). Southern carmine bee-eaters basking in the sun (please note the smaller white-fronted bee-eaters on the right of the picture). The white-fronted bee-eaters were very active and most likely involved in courting and nesting. A bit of reading when we returned to Harare revealed that mixed colonies of these two species are common. I also learnt later that these birds are colonial but also cooperative. The latter means that many individuals of both sexes play a role as helpers* and that they may switch from breeder to helper and back to breeder many times over a lifespan. White fronted bee-eaters at the river bank. Their borrowed nests are below. 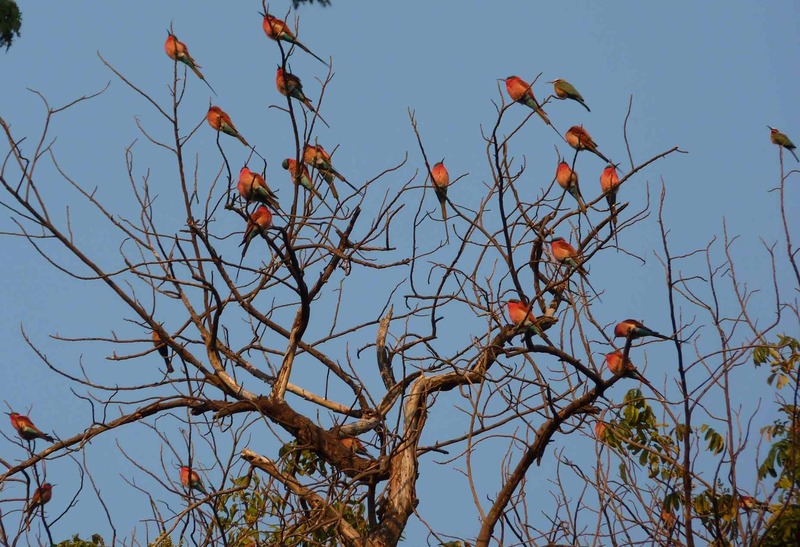 Every morning the carmine bee-eaters, after being sufficiently warmed by the sun, flew off for the day on unknown errands, and returned in the afternoon. Unfortunately I could not tell if these birds were also nesting in the banks but I suspect so. The proximity of our lodge to the water’s edge provided us with a continuous parade of animals without having to move too much. These included some really huge crocodiles as well as buffaloes, hippos and elephants: they were on both sides of the channel that ran in front of the lodge. It was wonderful to see elephants wading to reach the opposite shore only to return once they ate their fill of their favorite vegetation. Elephants crossing the channel (note the two termite nests in the background). The bushsnob prepared for a “monkey-proof” siesta! It all started with my wife becoming very agitated at the exact moment that I had duly dropped my book (on my face) and entered the “drifting off” stage of my nap! Her alert call brought me back to life. Before I could proffer my -I am sure expected- complaint, I heard a soft “Don’t move and look” I knew then that I should do as I was told! My eyes were filled with an elephant! Thankfully, its attention was solely on the Apple ring Acacia pods. I froze -purely out of fear rather than bushsnob wisdom- as the elephant was three metres away from me and still approaching! I immediately noticed that, although very close, it was after the pods on the floor and oblivious to its surroundings including me! With a super human effort, given my panic-driven semi paralytic state, I lifted my feet off the ground as it could have otherwise, unintentionally stepped on my bare feet (ouch…). The sight mesmerized me! Finally, it came to about a couple of metres and looked at me “Now I am history” I thought. However, it simply raised its head as if saluting me and continued with its feeding, slowly ambling past with the only heralds of its presence the crunching of pods, the rattle of those discarded and the occasional soft huffs of its trunk as it searched for more. The amazing thing about elephants is that despite their size, you will not hear them unless they want you to. While walking on tarmac elephant footpads make a whisper-like ‘chuff’, similar to the sound produced when one brushes a hand over the fabric of a pillow; on dusty earth they are virtually silent. At night, they silently walk through your campsite while browsing without disturbing anything. Finally, although I often trip over the tent ropes, I have never had an elephant doing so day or night! As my knees had suddenly turned into jelly, I did not move, even after it passed and not even when my wife’s “order” was issued: “That was close! Get up quick and take a picture of it before it goes away” When I managed to collect all my wits and do a mental inventory of the condition of my various body parts, it was too late and I could only see its backside moving off. Although we have had these kind of encounters before this was a very close one and it is quite an experience to be literally “face to trunk” with a fully-grown male elephant! The siesta was abandoned, this time for a good reason! 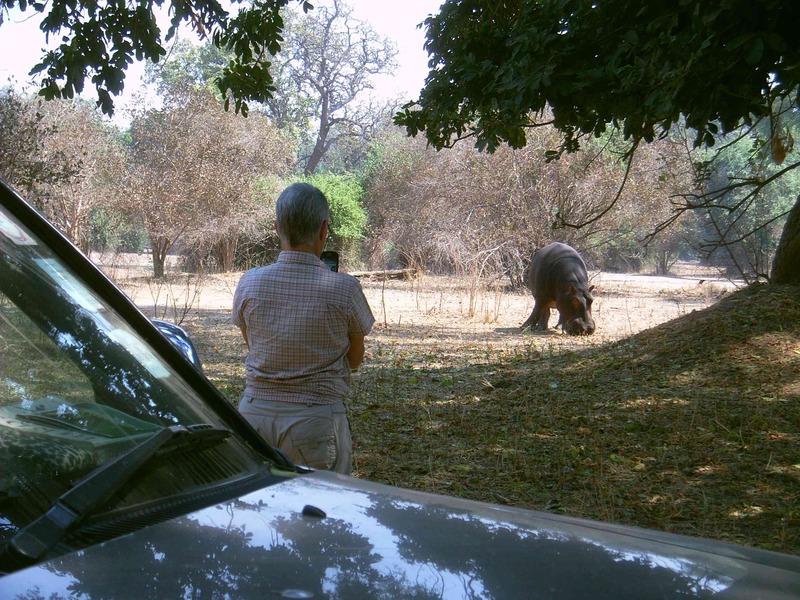 This was not the only occasion that this happened during our stay at Mana Pools but I describe it to you so that you have an idea of our interactions with wildlife at the park. 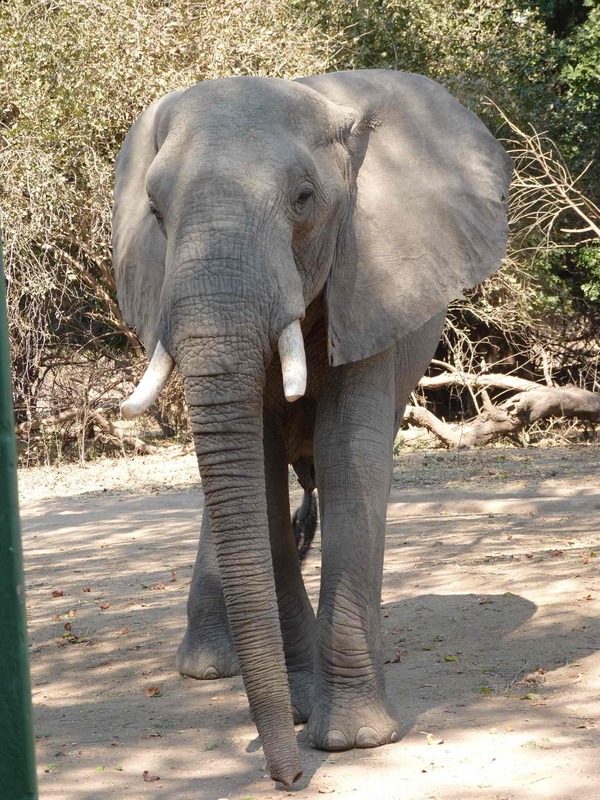 More than one tusker visited us everyday and a few family groups walked around the lodge during the day and night. They were even rude enough to try to spoil our BBQs! 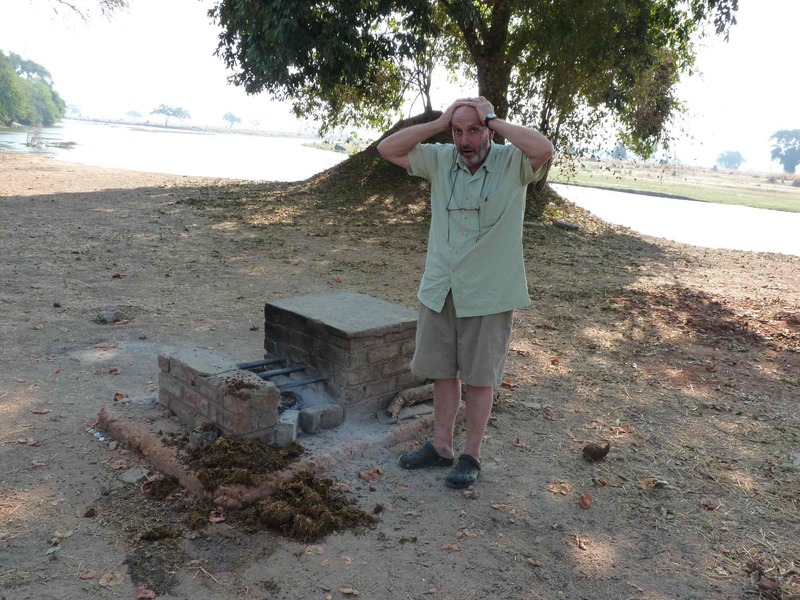 The bushsnob just discovered the bomb dropped by a “terrorist” elephant and he is horrified thinking on cleaning the mess (the faeces were almost pure Apple ring Acacia seeds!). In addition to the pachyderms, a lone hippo kept us company everyday as it fed on the pods. It would arrive after sunset and we would hear it chomping while it walked about. Although it occasionally entered the circle of light provided by our lamps, it preferred to stay in the dark. This meant that every now and then, we would have to locate it as it was an additional hazard while walking around our lodge (particularly when going to the BBQ area or the water boiler) to avoid the danger of bumping into it! My wife keeping an eye on our hippo visitor during a rarer day visit. A least one spotted hyena also did its food-run every evening. We did not think that hyenas were around as we did not hear them but they were afoot operating silently in the darkness! The lions were, quite to the contrary, rather close and very loud. They were heard, as my wife put it, “all night long” and a lioness and two cubs passed by while the occupant of our next-door lodge was having his morning coffee! with their parents and help them raise subsequent broods.